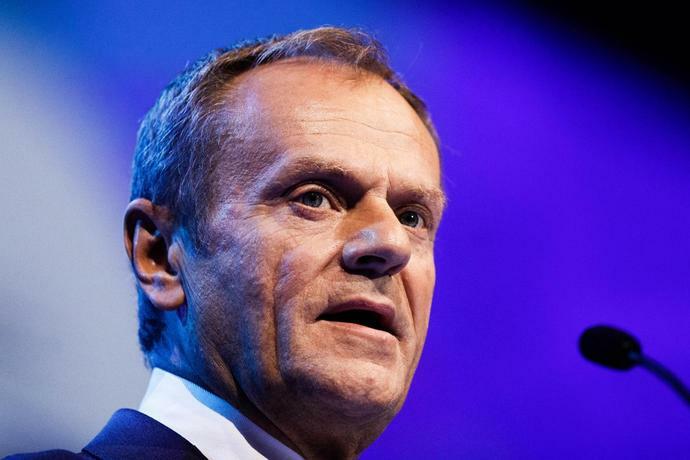 (Bloomberg) -- European Council President Donald Tusk is planning to return home to Poland to galvanize the opposition in this year's general election to challenge a nationalist ruling party that's clashed with Brussels over democratic standards, newspaper Rzeczpospolita reported. Tusk, who sets the agenda for European Union summits and has played a key role in Brexit negotiations, hasn't said whether he plans to return to front-line domestic politics after his term in Brussels ends in December. His spokesman said the report was "false." Rzeczpospolita said Friday that Tusk would "directly engage" in a new political project to consolidate groups against the Law & Justice government, but it didn't specify a role. Formerly Poland's longest-serving prime minister and leader of the opposition Civic Platform party, Tusk, 61, is widely considered the strongest opponent to Law & Justice party's re-election drive after repeatedly besting it in elections since 2007. Nevertheless, his potential return to combative domestic politics is fraught with risks, according to Jacek Sokolowski, a political scientist at Jagiellonian University in Krakow. "It's not clear if there's anyone better than Tusk to consolidate the opposition, but it's also far from clear if he'll be able to pull this off," Sokolowski said by phone. "This new initiative, if confirmed, could give him a trampoline to enter local politics, but he'd have to be all-in to have a chance. There's no going back to any plush job in Brussels if he loses." After a volatile four years battling EU allies amid accusations it's dismantling Poland's democratic order, Law & Justice is starting to see its support ebb. But it remains more popular than the biggest united group of opposition parties which, led by Civic Platform, hasn't created a viable message for voters beyond kicking out the ruling party. Tusk's colleagues are increasingly concerned about the inability of the Civic Platform to successfully team up with other groups in the EU's largest ex-communist member, according to Rzeczpospolita, whose report cited people close to Tusk. The party is now run by Grzegorz Schetyna, a former Tusk rival who's angling to become premier. The new movement, which is to include local administration officials and groups currently not in parliament, is set to start June 4 -- the 30th anniversary of the first partly-free elections behind the Iron Curtain that helped Poland break free from totalitarian rule, Rzeczpospolita said. Law & Justice has for years criticized Tusk, saying his failure to grant more concessions to the U.K. was directly responsible for Brexit. Tusk has also repeatedly testified to Polish prosecutors in a case regarding a 2010 plane crash in Russia, which killed then President Lech Kaczynski and other dignitaries while he was prime minister. No charges have been levied, but ruling party politicians have publicly said that Kaczynski, whose twin brother Jaroslaw is the leader of Law & Justice, was "murdered" by unknown Polish and Russian groups. Crash-scene investigators, as well as Tusk, have blamed the tragedy on pilot error. In November, Tusk warned in a speech that rising nationalist sentiment across the bloc posed a serious risk to the EU, especially as European Parliament elections approach in May. "Those who are cheering on nationalism in Europe, those who are betting on disintegration and conflict, will inevitably lead to an absolutely fundamental threat," Tusk said in the Polish city of Poznan. "I am talking here about the rise of nationalism and anti-European, not only rhetoric, but also anti-European emotion, in many European capitals." --With assistance from Jonathan Stearns.